The Thatcher Effect, also known as the Thatcher illusion, illustrates that the brain can’t properly process a photo of a face that is upside down. The interesting part is that the brain thinks it can so you get a confident feeling that everything is alright until you turn it over. & when you upside down the image …. Once it’s right side up the way your brain is used to it, it becomes quite obvious that something is wrong. In fact, what you see is that the mouth and eyes are upsides down. The illusion is named after Margaret Thatcher, former British Prime Minister, because her photo that was used to illustrate the illusion for the first time. 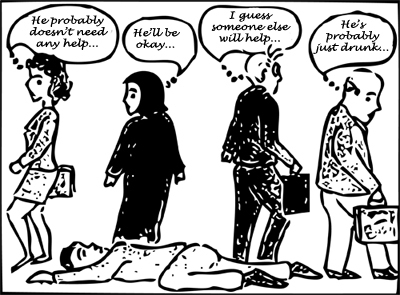 If you witnessed an emergency happening right before your eyes, you would certainly take some action to help the person in trouble, right? While we might all like to believe that this is true, psychologists suggest that whether or not your intervene might depend on upon the number of other witnesses present. In psychology, the Stroop effect is a demonstration of interference in the reaction time of a task. When the name of a color (e.g., “blue”, “green”, or “red”) is printed in a color not denoted by the name (e.g., the word “red” printed in blue ink instead of red ink), naming the color of the word takes longer and is more prone to errors than when the color of the ink matches the name of the color. Can you tell the color of the word spontaneously? When a person makes a mistake or acts in a clumsy way that might even make people laugh, they are found to be more likable, including in comparison with individuals who are more intelligent and smart. When you make a mistake, you appear more human, more like others and so more likable. People who are perfect can seem threatening, but people who are imperfect are safe and hence easier to truly like. The priming effect is an unconscious process and mostly goes undetected, But its effects can be seen in experiments. For example, if you have recently seen or heard the word EAT, you are temporarily more likely to complete the word fragment SO_P as SOUP than as SOAP. The opposite would happen, of course, if you had just seen WASH. EAT primes the idea of SOUP, and WASH primes SOAP. Your teen is in desperate need of a new wardrobe. You set a day for a shopping trip. Lucky you. It’s not long until your daughter finds the perfect pair of jeans. Great, you tell her — until you check the price tag: $149.95. Daughter’s delighted. Mom feels conned. What’s happening here? Ah, the anchoring effect in action. The McGurk effect is a perceptual phenomenon that demonstrates an interaction between hearing and vision in speech perception. The illusion occurs when the auditory component of one sound is paired with the visual component of another sound, leading to the perception of a third sound. Framing describes that our choices depend on how the problem is presented, the way the question is “framed”. Let’s look at a classic experiment as an example. 72% of participants chose option A. The Pygmalion effect, or Rosenthal effect, is the phenomenon whereby higher expectations lead to an increase in performance. The effect is named after the Greek myth of Pygmalion, a sculptor who fell in love with a statue he had carved. The Gruen Transfer is an interesting psychological phenomenon which strikes people in certain environments, making them more susceptible to making impulse buys or purchases which they might regret later. The classic signs that someone is experiencing this phenomenon are a dropped jaw, slightly glazed eyes, and a hazy, confused feeling; many people also begin to walk more slowly as this peculiar mental state sets in. Some psychologists have described the Gruen Transfer as an almost inactive state, where the mind ceases to function because it is experiencing too much input. Imagine you’re going into a large department store, with a mental list of things to buy. You need to buy eggs, milk, bread, juice and cornflakes. A typical breakfast. Why the large department store? Because that’s where you get cheap stuff, is why! When you enter the store, you’re shown things with discounts. This is where your list slowly starts to disintegrate. “Hey, they have grape juice at 20% off! Ah, who wants orange juice anyway?” You roam around the store, and instead of rushing to the aisles where the breakfast items are kept, you’re engaged with all the free goodies, the convoluted store structure, and a large number of items on display. Then you get to the isle with the eggs. There’s processed meat there. Take some bacon with that! So now your cart has orange, apple and grape juice too. Wow, a new power drill? Well, I do need to put a few paintings. Toilet paper rolls! Muesli with fruits and nuts! People think of everything! You get the idea. You went there to buy a cheap breakfast, and you came out with a huge number of items, half of which are unnecessary. No really. They are. You could have done just as easily without them. A circumstance where a group of individuals agrees to a course of action based on the theory, it is best for the group, despite going against the preferences of members of the group. This occurs when individuals feel their objections are not strong enough to support changing the minds of others in their group. Commonly referred to as “rocking the boat”. When you are exposed to an object(A) of a particular value, after being exposed to an object of considerably lower value, you perceive A’s value higher than its actual value. Below we can see the black image has the brightest gray rectangle at the center. Here is an another experiment to demonstrate it. Suppose you have three bowls, one for hot water, one for cold water and one for normal water. Now put your left hand in hot water and right hand one in cold water simultaneously. Now after few seconds, remove both hands from their respective bowls and put them in the normal water. What do you observe? For your left hand, the water will appear colder, however for the right one; it will seem hotter. The halo effect is a cognitive bias in which an observer’s overall impression of a person, company, brand, or product influences the observer’s feelings and thoughts about that entity’s character or properties. It was named by psychologist Edward Thorndike about a person being perceived as having a halo. We can simulate an analgesic therapy by giving the patient a sugar pill or a glass of fresh water along with the verbal suggestions that it is a powerful painkiller. The essential point here is that the patient trusts the doctor, believes in the treatment and thus expects a clinical benefit. The placebo effect is, therefore, the effect of the psychosocial context around the therapy, particularly its verbal component, on the patient’s brain. The nocebo effect is the reverse of the placebo effect. Expectations of clinical worsening may induce a real worsening, such as an increase in pain. Therefore, it is important to understand that neither sugar pills nor glasses of water will ever acquire the capacity to heal. Only thing matters are the words that administer along with the sugar or water. When objects are evaluated separately rather than jointly, decision makers focus less on attributes that are important and are influenced more by attributes that are easy to evaluate. The less-is-better effect suggests a preference reversal when objects are considered together instead of separately. participants perceived people were giving away a $45 scarf as more generous than those who gave a cheap $55 coat. The Google effect also called digital amnesia, is the tendency to forget information that can be found readily online by using Internet search engines such as Google. According to the first study about the Google effect, people are less likely to remember certain details they believe will be accessible online. Your friend told you about that obscure bluegrass-electro-punk band yesterday morning. That afternoon, you ran across one of their albums at a garage sale. Wait a minute — that’s them in that Doritos commercial, too! Coincidence … or conspiracy? More likely, you’re experiencing “frequency illusion,” somewhat better known as the Baader-Meinhof phenomenon. The mere–exposure effect is a psychological phenomenon by which people tend to develop a preference for things merely because they are familiar with them. In social psychology, this effect is sometimes called the familiarity principle. The Ben Franklin effect is a proposed psychological phenomenon: A person who has performed a favor for someone is more likely to do another favor for that person than they would be if they had received a favor from that person. When we ask a colleague to do us a favor, we are signaling that we consider them to have something we don’t, whether more intelligence, more knowledge, more skills, or whatever. This is another way of showing admiration and respect, something the other person may not have noticed from us before. This immediately raises their opinion of us and makes them more willing to help us again both because they enjoy the admiration and have genuinely started to like us. This is Ben Franklin effect. The Benjamin Franklin Effect works but shouldn’t. It should be the other way around. People should feel closer to you if you’ve done them a favor rather than you. Often called a problem solving set, Einstellung refers to a person’s predisposition to solve a given problem in a specific manner even though better or more appropriate methods of solving the problem exist. The Einstellung effect is the negative effect of previous experience when solving new problems. The Einstellung Effect is more ubiquitous than its name suggests. We constantly experience it when trying to solve a problem by pursuing solutions that have worked for us in the past – instead of evaluating and addressing it on its own terms. Thus, while we may eventually solve the problem, we may also be wasting an opportunity to so in a more rapid, effective, and resourceful manner. Think of a chess match. If you are a chess master with a deep familiarity with chess history, you are likely to spot game developments that look similar to other matches that you know by heart. Knowing how those previous matches unfolded, you may automatically pursue similar solutions. 1.) John objects to gay marriage because he is disgusted by homosexuality. Unable to see how anyone else could support it despite that disgust or even not be disgusted at all, he concludes that most others share his belief. 2.) Jane, a fundamentalist Christian, believes that people like her represent a “silent and moral majority.” However, she has only anecdotal evidence (her family and closest friends share her beliefs) to support her belief. The focusing effect is the fact that people make decisions by the most pronounced and distinct information they have available in their working memory, and for this reason, other pieces of possibly useful information are excluded. So, the decision is only based on fractions of the total amount of knowledge or information that one has stored. When people were asked, how much they believed that Californians were happier than Midwesterners, both Californians and Mid-westerns reported that Californians were happier, but the study did not find such a difference in measured happiness. These findings reflect the focusing effect in that people overestimate the positive influences of sunny weather and the easy-going lifestyle of Californians. Interestingly, other aspects of life such as low crime rates, and safety from earthquakes were not considered in the process of decision-making due to the focusing effect. The Forer effect is a term used to describe the tendency of people to interpret general statements as being accurate for them personally, even when they are not. Specifically, when people are given a random personality assessment and told it has been written for them, personally, they will tend to rate it as highly accurate. For example, astrology is based largely on personality assessment. People believe it works because they believe the assessments offered by astrology are reasonably accurate. However another well-known experiment showed otherwise: In 1979 French statistician Michel Gauquelin asked 150 people to rate a horoscope reading for how accurately it described their character. 94% rated the horoscope as accurate. The horoscope readings were fake—all 150 people had been given the horoscope of a serial killer named Marcel Petiot. The Forer effect is found in many areas related to the paranormal; for example, psychic readings, biorhythms, tarot readings, etc.